In movies about teenagers, single dads often come across as more absentee or overbearing than they do empathetic. Sure, some feature arcs that end with a father capable of providing his children with adequate emotional support - which, to be fair, is how most mothers are expected to be from the get-go - but fewer start off this way. We've met a lot more like Harry Dean Stanton's downtrodden dad in Pretty in Pink or Larry Miller's overprotective dad in 10 Things I Hate About You than we have those like Atticus Finch in To Kill a Mockingbird. That changed this summer, when the progressive movie gods that be gave us a bunch of sensitive single dads to root for. 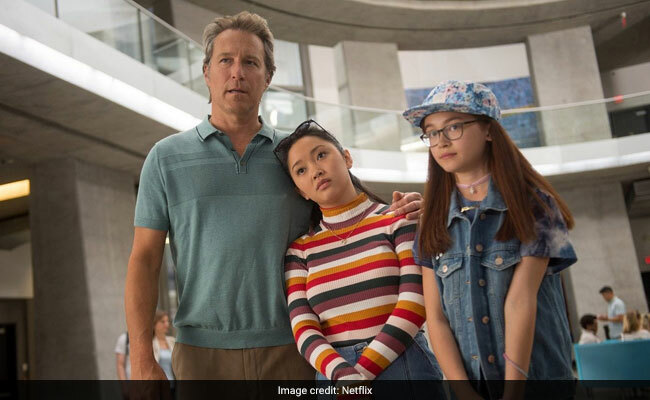 From To All the Boys I've Loved Before to Eighth Grade, the dads display a brand of thoughtfulness often reserved for their female counterparts. They guide their daughters like the competent caretakers they are, avoiding the bumbling Mr. Mom portrayals of movies past. We begin with Dr. Covey, a teary-eyed man played by John Corbett of My Big Fat Greek Wedding fame. To All the Boys, Susan Johnson's adaptation of Jenny Han's young adult book, centers on middle child Lara Jean (Lana Condor), a high school junior who fakes a relationship with jock Peter Kavinsky (Noah Centineo) in order to hide her feelings for someone else. Lara Jean's 12-year-old sister remarks early in the movie that she was still eating smushed peas when their mother died, which, by our calculations, means that Dr. Covey has been raising three daughters on his own for a little more than a decade. It shows. Dr. Covey remembers meeting "little Peter Kavinsky" when Lara Jean was young - but let's be real, who wouldn't? - and is acutely aware of how much happier and more confident she becomes as she "dates" Peter. He recognizes his limitations and, when Lara Jean struggles with her relationship, takes her to the diner he used to frequent with her mother to honor the place she holds in Lara Jean's heart: "Seeing you come alive like that, you remind me of her," he tells his daughter. "Just don't hide that part of yourself, okay, honey?" As someone on Twitter pointed out, Dr. Covey seems to be an upgraded version of Walter Stratford (Miller) in 10 Things I Hate About You. Both men are widowed gynecologists, but whereas Walter straps a pregnancy suit onto his daughter Bianca to scare her away from kissing boys, Dr. Covey attempts to have an honest conversation with Lara Jean before she goes on a ski trip by asking, "Did you know most unwanted teenage pregnancies are the result of expecting abstinence?" Lara Jean responds with an "Ew, dad, what are you doing?!" expression, of course. It's much like the one that Kayla (Elsie Fisher) wears throughout Eighth Grade, a movie in which writer-director Bo Burnham skillfully captures how awkward, terrible and yet occasionally pleasant that age can be. Kayla struggles to navigate the emotional minefield that is junior high, and as a result, her dad, Mark (Josh Hamilton), winds up the only constant presence in her life. The second best thing about Mark is that his scenes with Kayla relieve stress built up from watching her uneasily attend a popular girl's birthday party or tag along with older kids to the mall. The first? His patience. He knows that the shy teenager needs to be left alone sometimes, so he tests the waters by playfully throwing a green bean at Kayla when she spends more time staring at her phone than eating dinner. He puts up with her occasional outbursts - the man has a note in his phone to remind him of how much Kayla hates bananas! - and lightens the mood with exceptionally earnest dad jokes. And he lets Kayla experience things for herself, letting her know that he will be there for her whenever she needs him. Immediately after Kayla quietly admits that she would be "really sad" to one day be a mother to a daughter like herself, he delivers a short monologue so healing that it rivals the parental wisdom Michael Stuhlbarg shares with Timothée Chalamet in Call Me By Your Name. "Some parents have to love their kids in spite of who their kids are," he says as audience members shed many tears. "Not me. I get to love you because of who you are." But wait, there's more. Brett Haley's Hearts Beat Loud follows indie dad Frank Fisher (Nick Offerman), a longtime widower and failing record store owner in Brooklyn who struggles to cope with the nearing departure of his UCLA-bound daughter, Sam (Kiersey Clemons). While Frank needs to grow up a bit more than his movie-dad peers - the loose plot involves him trying to convince the talented Sam to forgo her pre-med future and and start a band with him instead - his selfishness comes from a place of love, and he learns to get past it. His dream is ultimately for his daughter to fulfill hers, similar to what the single dad in The Kissing Booth (Stephen Jennings, who we don't really see much) tells his daughter, Elle (Joey King), when he disapproves of her rebellious boyfriend but trusts her enough to make her own choices. The past few months also presented us with the single fathers played by John Cho in Aneesh Chaganty's Searching and Ben Foster in Debra Granik's Leave No Trace, both of whom lean more "Mrs. Doubtfire"-style parenting overhaul than Dr. Covey-style persistent understanding, if only because they make heartbreaking discoveries in an effort to do right by their teenage daughters: David Kim (Cho) realizes he hasn't done enough to comfort the troubled Margot (Michelle La) after her mother's death, whereas Will (Foster), a veteran suffering from severe PTSD, recognizes that his life on the outskirts doesn't provide his 13-year-old daughter with the regular human interaction she needs. Despite their vastly different circumstances, all five summer-movie dads recognize what our society as a whole has increasingly come to realize: that their responsibility as a caretaker is to consider the emotional health of their children and to be there to help boost it - not as a replacement for their mothers, but as a parent in their own right. It's like Mark tells Kayla in that pivotal scene: He is "just so unbelievably happy" that he gets to be her dad. We couldn't agree more.